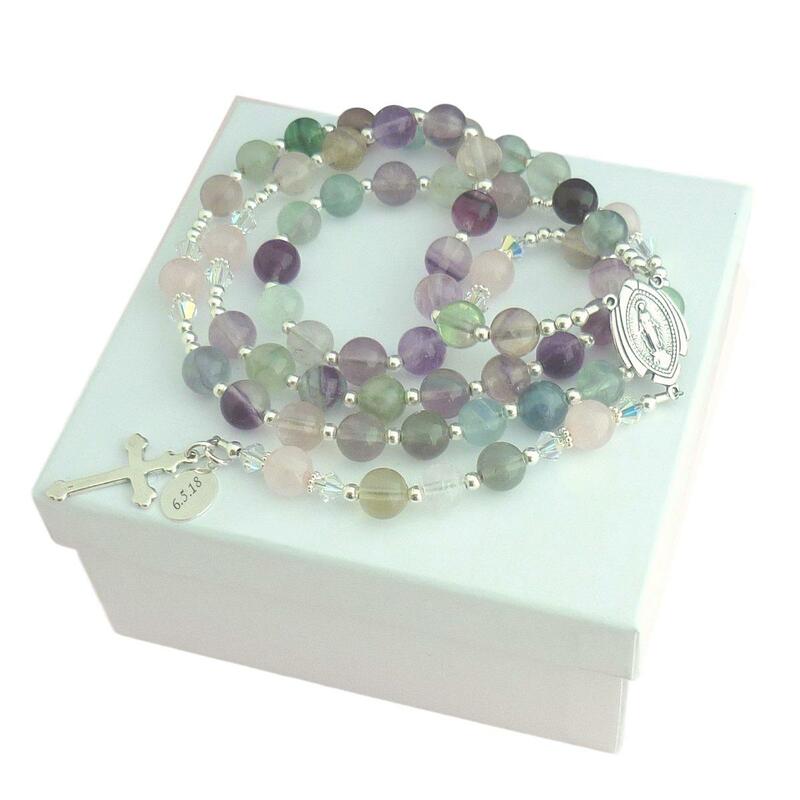 Beautiful Heirloom Quality Personalised Rosary Beads with Fluorite & Delicate Rose Quartz. Made with genuine semi-precious gemstones. 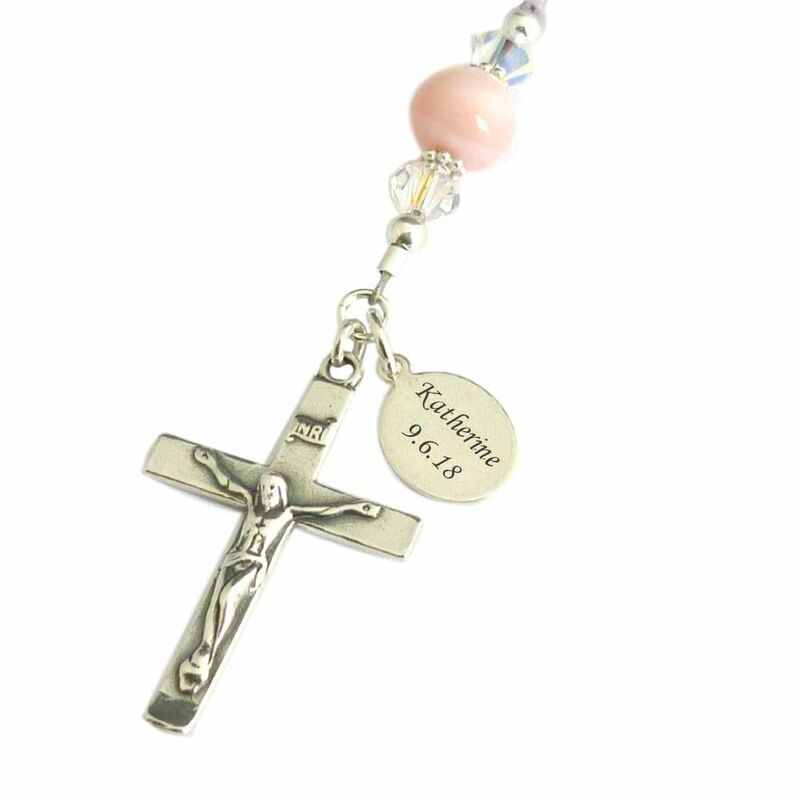 Personalised Prayer beads make wonderful gifts for so many occasions including: First Holy Communion, Baptism, Confirmation, Wedding or Birthday. Matching personalised rosary bracelet also available. 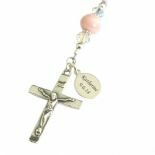 Our personalised rosaries are supplied in your choice of gift box with a little gift card with space for you to write in your own personal message. 1. Long black gift box - no charge. 2. White leatherette gift box with white card outer packaging. 3. White leatherette gift box with white card outer packaging topped with an organza bow. Engraving: The little Sterling silver oval tag sits discreetly behind the cross. We can engrave this with up to 18 characters per side (including spaces). Perfect for adding names, dates, love from... or occasion details. Engravings are done in calligraphy font unless otherwise requested. Centre Piece: Choose from one of three centres shown; 1. Virgin Mary 2. Jesus Christ 3. Dove of Peace. 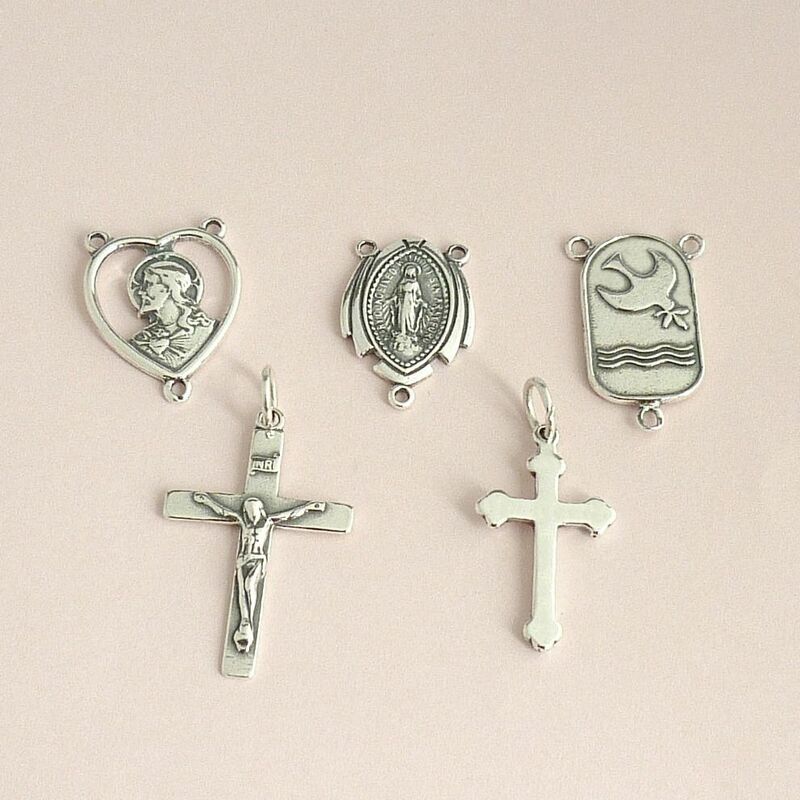 Cross Choice: Choose a solid silver plain cross or crucifix. Colours: Comes in the colours shown but we can change the clear crystals to birthstone crystals on request. Size: Long enough to fit over the head of an adult or child. Each gemstone measures approx 8mm. 1. Which centre piece would you like? 2. Which cross would you like? 3. What would you like engraved on the silver tag? - Maximum 18 characters per side.